Please find attached the flyer for the 2019 NSW Bowling Arm Singles Tournament to be hosted by Beresfield and East Maitland Bowling Clubs. All entries should be forwarded by email as soon as possible as there are limited nomination opportunities. As in the past, this tournament will provide an additional occasion for the NSW Woomeras Selectors to monitor performances for selections in the 2019 NSW Woomeras team to play at Tranmere SA in September. That team will consist of a squad of 18 players, two of whom are to be women along with a Manager and Assistant Manager. Click the link below to download the flyer to your computer. 7th National Bowling Arm Sides Championships at Tranmere, Adelaide S.A. Sunday 8th – Thursday 12th September. Click on the blue link for each event to reveal the flyer or other information. (Did you know, you can also check out the results from last years tournaments (with photos) under the heading “Tournament Results” and “NSW”? 11 May ’19 Finley Bowls Club “Arm Tussle” 3 Bowl Pairs. Click this link to download the flyer to your computer. 15-16 Nov ’18 Teralba 5 Games of 2 Bowl Triples. 7 Aug ’17 Finley R.S.B.C. 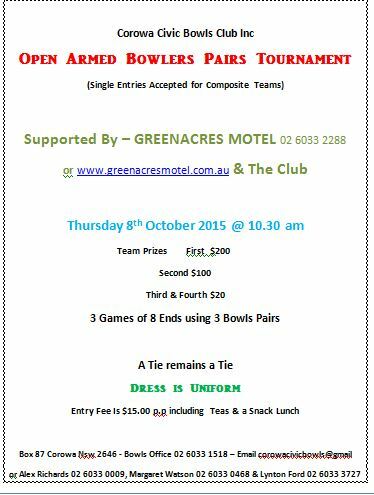 “Bowlers Armed Tussle” 3 Bowl Pairs. What a great warm up “tussle” for those competing in the National C’ships ….Finley is just down the road “really”, from Moama. (Check out Tournament organizer Karen Peacock’s wonderful report with lot’s of photo’s from last years event, under the “Tournament Results” heading. “Vic.”. You can contact her on 0458 324 004 or email her at mrspea@bigpond.com She’d love to hear from you! These two new “Knockout” events are are the initiative of the Newcastle District Bowling Assoc. and are to be played at the supportive Beresfield and East Maitland Bowling Clubs. All organisation and running of the Singles and Pairs is the responsibility of the NDBA. Additional information may be sought as indicated on the entry forms from Newcastle District Bowling Association or by clicking on the links provided on this page. 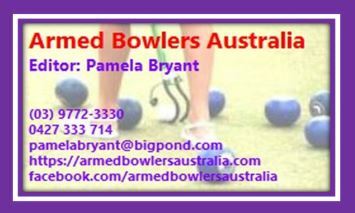 A NSW (certificated) Armed Bowler from “any NSW Region” is eligible to enter these events. The Singles Championship ($11 entry) will commence on Monday 13th Feb. ’17 with Rd.1 at 10.00am (Trial ends 9.40am) and Rd 2 at 1.15pm (Trial ends 12.55pm), subsequent rounds will be played on the following day, Tuesday, 14th Feb. ’17. Entries close 25th Jan.‘17. All games will be 25 shots up, and are knockout. The Pairs Championship ($11 p.p.) will commence on Monday 13th Mar. ’17 with Rd. 1 at 10.00am (Trial ends 9.40am) and Rd 2 at 1.15pm (Trial ends 12.55pm), subsequent rounds will be played on the following day, Tuesday 14th Mar. ’17. Entries close 22nd Feb. ’17. All games will be in the 3 bowls X 18 ends format and are knockout. Should there be more participants than expected in either of the above events, further rounds would be played on the following Monday and/or Tuesday of each event. Event cancelled due to Rain.”The NSW Bowlers Arm Committee has nominated the following players to form a provisional selection squad for the 2016 NSW Woomeras which will be composed of 15 players with 2 Reserves and 1 Manager. At least two players are to be women. Each state will have 3 teams of 5 that will compete Singles and Fours in the mornings and Pairs and Triples in the afternoon. One opposition state will be played daily on a rotation basis. All nominees should make every effort to attend the initial session at Beresfield BC on Monday 4th July with roll-up from 2.00pm and training commencing at 2.30pm through to 4.30pm. The final determination of the 2016 NSW Woomeras will be made immediately after the Sunday 10th July NSW Bowlers Arm Pairs Tournament held at Beresfield. It would be beneficial that all aspirants play in the Pairs Tournament as this will be the final opportunity for the Selectors to overview players’ status. Please find above entry forms for the 2016 NSW Singles and 2016 NSW Nominated Pairs Bowlers Arm Tournaments. Early entry is strongly suggested as the events fill very quickly due to limited places available. Participants in both the Singles and Pairs events will be open for selection in the 2016 NSW Woomeras team to play in the 2016 National Championships to be hosted in Queensland during September. If you could also assist by advertising and informing bowling arm players through whatever media is available to you, this would be greatly appreciated. Monday 6th and Tuesday 7th June 2016 NSW Bowlers Arm Singles Tournament at Beresfield and East Maitland. This event needs rescheduling, as epic storm/rain event of that weekend forced it’s cancellation. Our thoughts are with those caught up in this rain event and we look forward to a new date in perfect conditions. 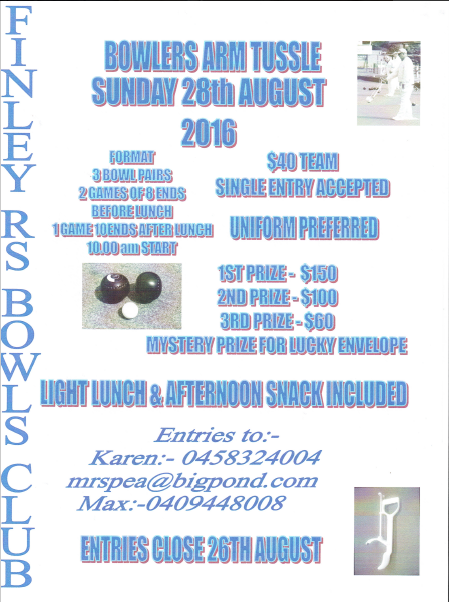 28 Aug ‘16 Finley RS BC 3 Bowl Pairs Click here for the flyer. Corowa has regretfully had to cancel their Armed Day this Thursday as they are surrounded by flood waters and, the Council have shut down access for a week. Car parking was going to be a problem as the River is yet to peak and the greens are suffering as a result of the high water table. Thanks Lynton Ford for this advice. We wish them all the best for their Pennant season and hope the flood waters recede quickly. Hopefully you can reschedule or have better luck next year.